Our team has designed Hospital Accreditation Documentation Kit to help hospitals in designing quick documentation for NABH accreditation. The accreditation documents are easily editable. The total documentation kit is available with simple modification features and it is easy to make the documents meeting the requirements of system accreditation. The complete set of hospital documents will assist in effective accreditation process. It is based on hospital accreditation system requirements, which assist users to understand quality systems in hospitals and how to achieve fast and effective hospital accreditation certification. Exhibits and Standard Operating Procedures to follow while implementing system (78 SOPs). Set of more than 64 standard blank forms and system formats to fill up records and learn system requirements. 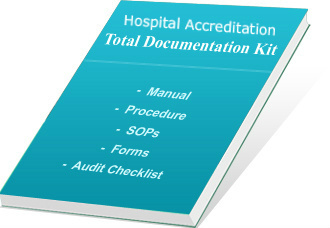 Audit checklists, which are used to verify implemented hospital accreditation system. The entire Hospital Accreditation Document Kit is available in editable format, so it is very easy to edit and upgrade as per your organizational requirement. It is well-written in simple English and is compatible with Windows 1997 and higher versions. Our documentation package is competitively priced and meets the demands of the NABH standard and other national hospital standards for different countries. The complete set of documents is designed for Hospital accreditation, which are compatible with global accreditation system requirements. Procedures and formats provided in the documentation kit help in fine-tuning the processes and establishing better control over management system. Saves much time and cost in document preparation as given templates are editable. It gives value for money to customers and instances of payback are very low. Ready-to-use documents in .doc format reduce your time in documentation process as well as useful in learning system requirements. Takes care for all the sections and sub-sections of global hospital accreditation standards. It helps in making hospital quality manual, procedures, policy and audit checklists for accelerating documentation process. On successful completion of payment process, we provide username and password to download the product from our FTP server. Delivery of our products will be within 12 hours of payment confirmation by secure third-party payment gateway. View free Demo of NABH Documentation Kit and purchase it with secure online transaction.